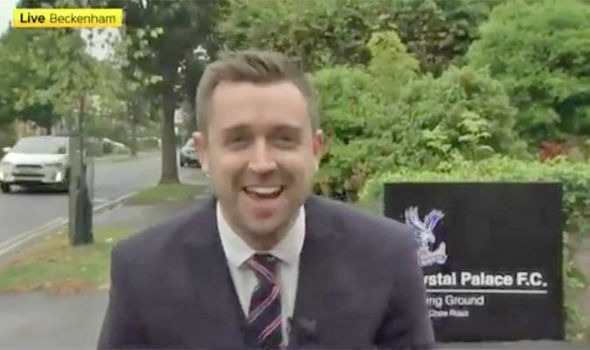 Crystal Palace's Patrick van Aanholt splashed a puddle over Sky Sports News reporter Michael Bridge as he was driving into the training ground. During a report outside Crystal Palace's training headquarters, van Aanholt clearly didn't spot the puddle as he drove through it soaking the journalist in the process. A tweet from Palace's Patrick van Aanholt made clear that he was the man behind the wheel of the vehicle. With Bridge replying to his tweet, Van Aanholt added that he'd be happy to lend him some dry clothing to see him through the rest of the day. Then Christian Benteke fired a warning to Michael. The charismatic presenter is a firm favourite among Palace supporters given he regularly provides deadline-day briefings on the club's comings and goings. Sky Sports News reporters are all over the country on Deadline Day bringing you all the latest transfer news with the window set to close at 5pm. Supporters will be hoping on the outgoings front Bridge rarely gets the airtime as they look to hold on to star asset Wilfried Zaha.